Pinky saw Next to Normal last year during its Off-Broadway run and raved about it. I was hesitant to watch it because it deals with mental illness, a topic not usually tackled in musical theatre, and something for which I wasn't prepared to see at the time. But I finally viewed it this past weekend with Pinky, and I was blown away. This musical had us both reaching for the tissues. It is packed with emotional wallop and universal truths. Alice Ripley is Diana, struggling with her depression, bipolar disorder and other diagnoses. 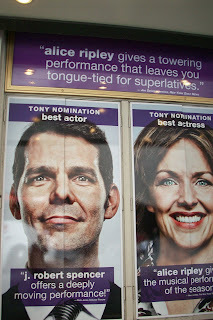 J. Robert Spencer took over the role of Dan (the ever supportive husband and father) from Brian D'Arcy James. Jennifer Damiano (Natalie) and Aaron Tveit(Gabe) are their children. 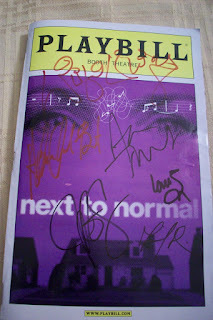 Louis Hobson plays various doctors, while Adam Chanler-Berat is Henry, Natalie's loyal friend. The singing is outstanding. Tom Kitt's pop rock music is catchy---hummable and affecting. Most of our fellow audience members were older, and it was interesting to see them bob their heads and tap their feet to the music. The lyrics are alternately touching-funny and acerbic-funny, but always heart-breaking. The show is mostly through-sung, which made the show even more engaging. I was a captive viewer. The book is cleverly written, as we come to know each character's merits and malfunction bit by bit. But the sensitive subject is respectfully treated. I felt for all of these characters. This was the first show in a very long time that reduced me to a sobbing mess. If I was watching it alone at home, it would have been a chin-quivering, shoulder-shaking, complete meltdown. So if you feel like this is just going to be Another Day, I am the One to tell you to see Next to Normal. Why Stay? It is Perfect for You. And although it left me feeling raw and ripped to shreds, it's good because it was courageous, gripping, honest yet hopeful about human nature. 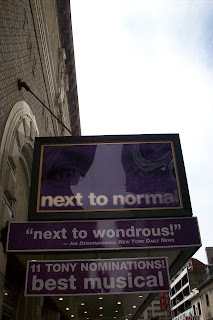 Next to Normal is a Light in the Dark. Yeah this time around the songs are more cohesive and pushes the story forward. I don't think I've wept this much in a show before.